It took me awhile to get around to this record, a favorite around the office. Mainly, somebody was always “checking it out” so I couldn’t get to it, lit’rally. But, with the weather growing colder and wetter, it’s fitting that E.T. and Lorretta comes back to me as I get more ruminative–mainly, about intimate relationships, obligations, estrangement, and coping strategies, from the good and the bad to the past and the present. Mrs. and Mrs. Used to Be is split down the middle, between the happy, inseparable days and the past, tense high-lonesome. Even the title forges a connection in disconnectedness. Tubb’s plaintive, gruff counterpoint to Lynn’s confident twang proved resonant to country fans who enjoyed this balance of voices, personalities, and themes, all accompanied by the silver meow of electric guitar and heavier percussion. These were times of social upheaval; the songs themselves, in performance and track sequencing, are evidence of the changes taking place in institutions like marriage, where women like Lynn forge ahead with independence and confidence. 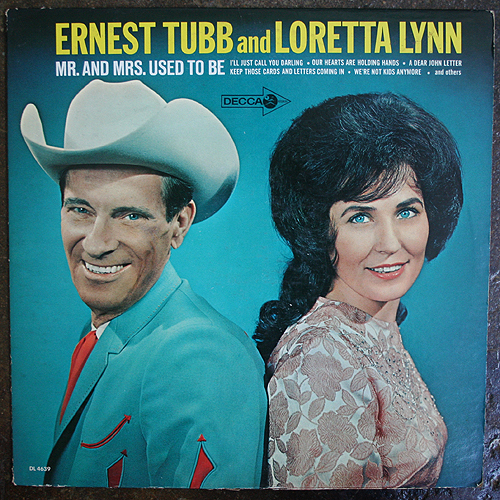 This first duets album started off a fruitful collaboration, if all too brief, that amounts to the best country female/male due of all time. (Conway has nothing on Tubb’s grit, even if he is a good singer and interpreter).